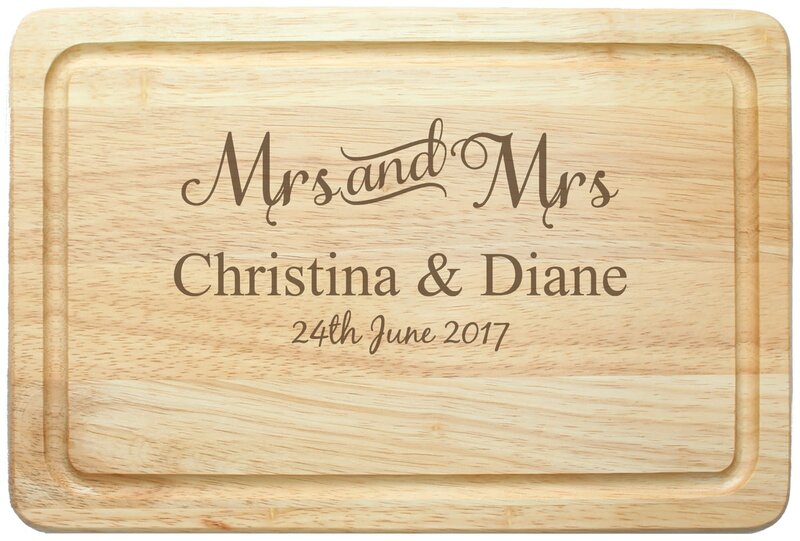 Personalise this Mrs & Mrs Chopping Board with a couples names up to 30 characters and date up to 20 characters. 'Mrs & Mrs' is fixed. Please note as the chopping board is a natural wood product, colour and grain may vary from board to board. This may also cause the engraving to appear slightly darker or lighter in places, however the surface should be smooth and even. Personalise this Mr & Mrs Chopping Board with a couples names up to 30 characters and date up to 20 characters. Personalise this Mr & Mr Chopping Board with a couples names up to 30 characters and date up to 20 characters. 'Mr & Mr' is fixed. Personalise this Mrs & Mrs Frame with any message over 2 lines and up to 30 characters per line. Personalise this Mr & Mr Frame with any message over 2 lines and up to 30 characters per line. Did you know wood is the traditional gift for a 5th Wedding Anniversary? Our cheesy Chilli and Bubbles characters do, and they're here to help celebrate an anniversary in style.